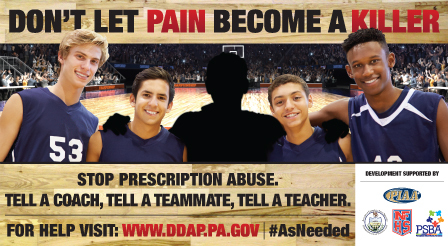 PIAA has teamed up with the Pennsylvania Office of the Attorney General to fight opioid abuse. 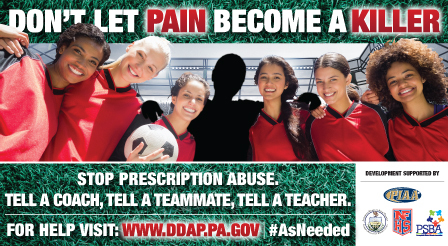 As part of this year’s “Don’t Let Pain Become a Killer” campaign we would like to encourage school TV production studios and students to create a public service announcement (PSA) that raises awareness of opioid abuse in our communities. The winning spots will be played during the 2019-20 statewide telecasts of selected PIAA Championship broadcasts on the Pennsylvania Cable Network (PCN) and on-site on the videoboards in our championship venues. In addition, two cash prizes will be awarded to the chosen schools to be used as they see fit to enhance their TV production departments. Special thanks to the Pennsylvania School Boards Association (PSBA) and the National Federation of State High School Associations (NFHS) for their support of this program. The rules for the contest are below as well as some marketing collateral for the students to use in the spots if desired.